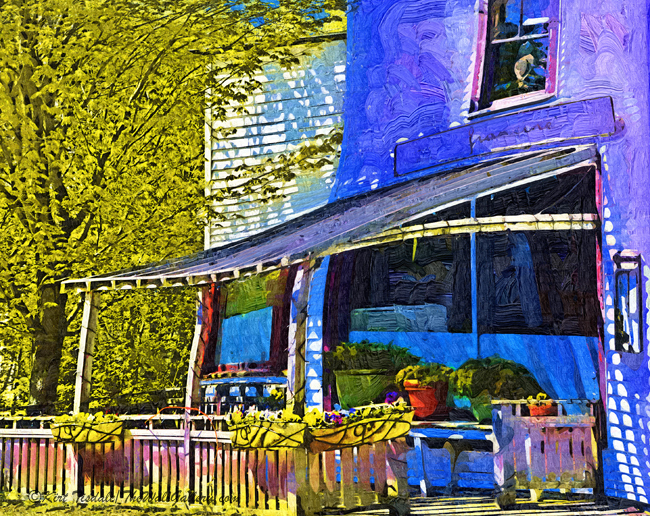 “Admiralty Point” is an art print of a lighthouse using a fauvism oil technique. This technique focuses on bold brush strokes, bright colors and abstract shapes. 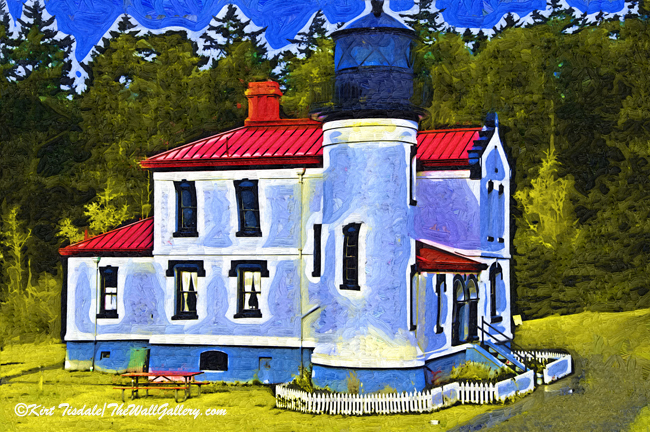 The setting is the Admiralty Point Lighthouse that is located with Fort Casey on Whidbey Island north of Seattle. The lighthouse and fort are situated on the northern end of Puget Sound. Thoughts? 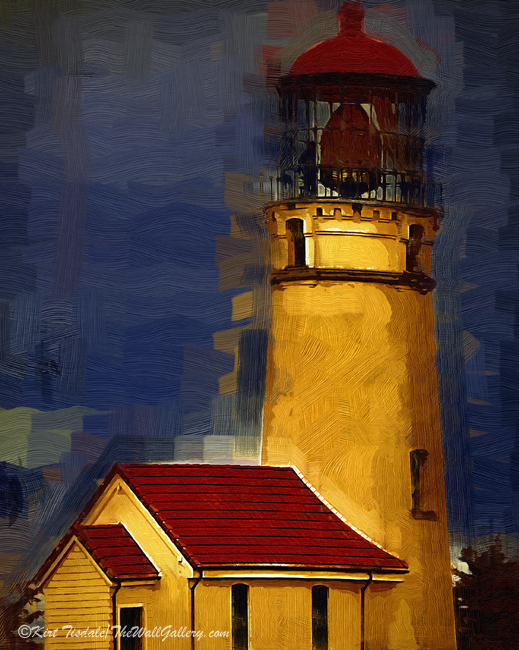 This entry was posted in Abstract Oil, Art Prints and tagged Admiralty Point Lighthouse, art galleries, artist kirt tisdale, interior design, light houses, online art gallery, pacific northwest, Whidbey Island on October 5, 2016 by Kirt D Tisdale. On one of our many trips up to Seattle to see our youngest daughter, my wife and I decided to do a road trip winding our way up the Oregon Coastline. 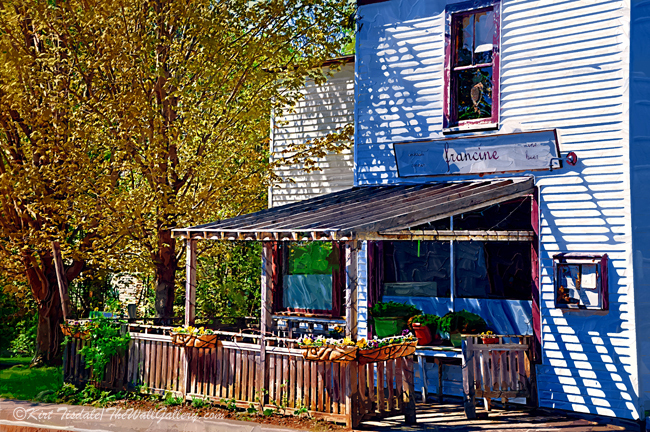 Our goal was to visit the string of Oregon Lighthouses that dot the rugged coastline. 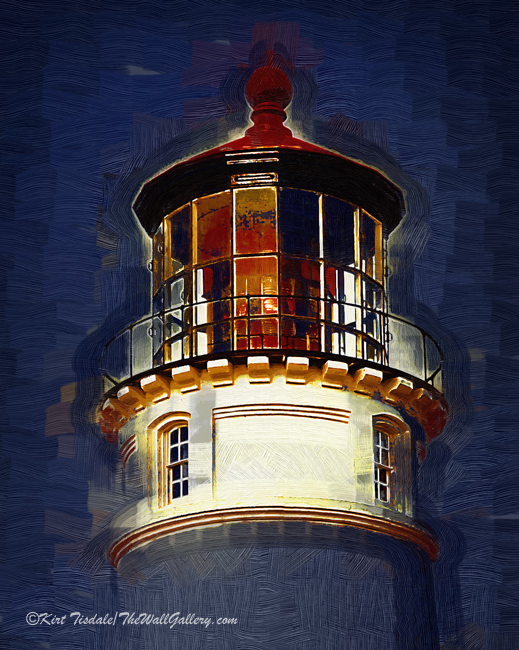 I have attached five art prints from my Lighthouse/Nautical Gallery that I created as a result. 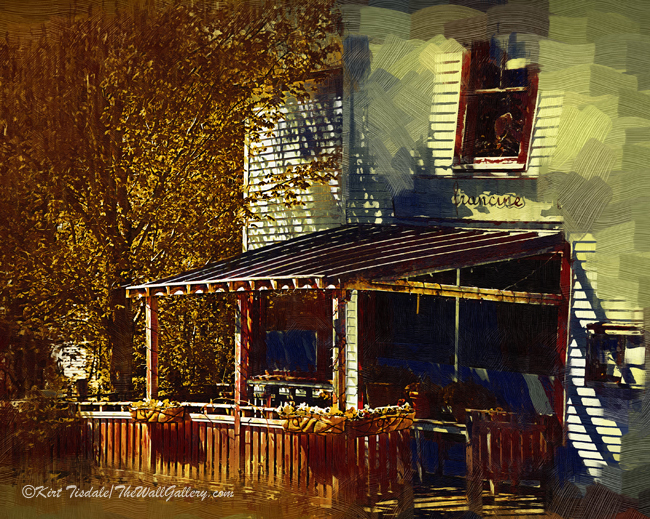 With these particular prints, I used a gothic oil technique to create an old world look and feel to the subject matter. This technique uses bold brush strokes and warm earth tone colors. The first print is of the Heceda Head Complex. The road winds along the rugged bluffs to a parking area by the caretaker’s house in the right portion of the picture. From the house, you hike a path hugging the bluff to the lighthouse itself, a path the lighthouse caretaker had to take daily to get out to the point. The second print is of the Cape Blanco Lighthouse, sitting high above the pounding surf of the Pacific Ocean. 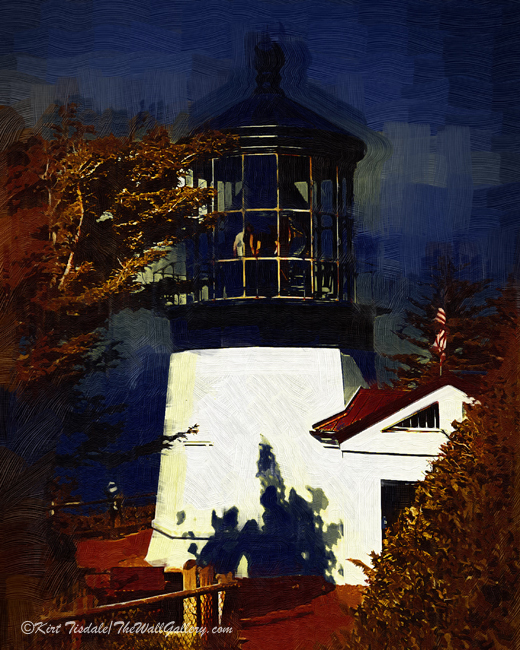 With the third print, I wanted to focus just on the light portion of the Umpqua Lighthouse. I like the intricate architecture, especially against a deep blue sky. 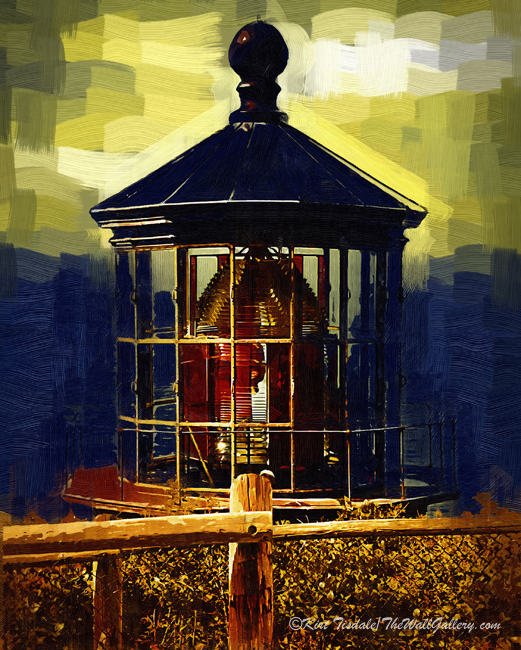 The fourth art print is your view of the Cape Meares Lighthouse as you walk a descending path to the facility itself. As you are coming down the hill, you are suddenly at eye level with the light and then you continue down to a switchback…..
where you come face to face with the short, but beautiful Cape Meares Lighthouse. 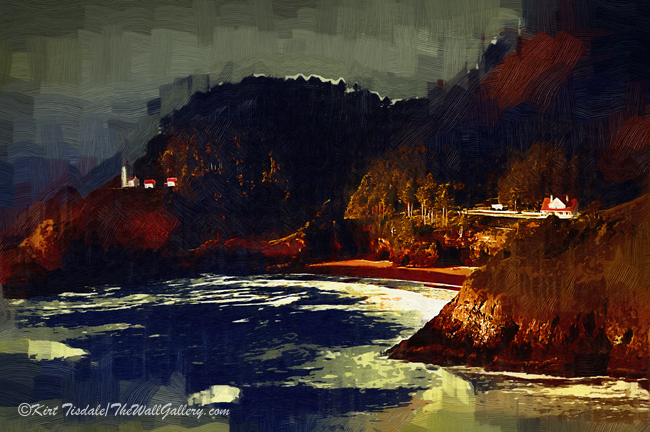 This entry was posted in Art Prints, Landscapes: Oil and tagged art galleries, artist kirt tisdale, coastal art, interior design, lighthouses, online art gallery, oregon coastline, oregon lighthouses, pacific ocean on November 11, 2015 by Kirt D Tisdale. I invite you to visit my Inspiration Gallery to enjoy these prints and many more. 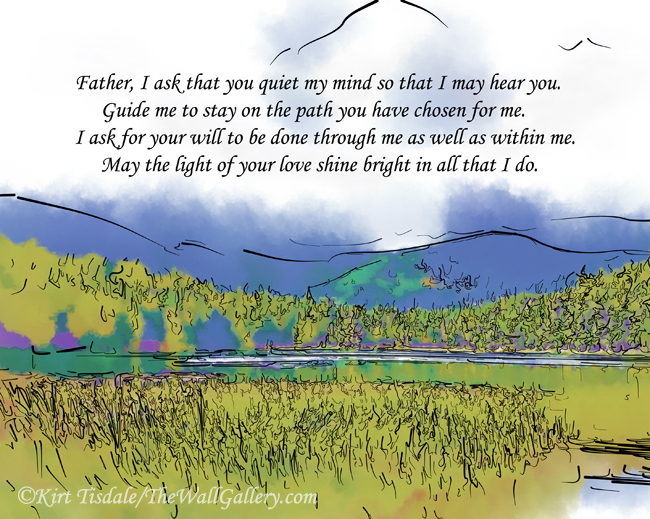 This entry was posted in Abstract Watercolors, Landscapes: Watercolor and tagged art galleries, artist kirt tisdale, inspirational quotes, interior design, online art gallery, prayer on September 19, 2015 by Kirt D Tisdale. 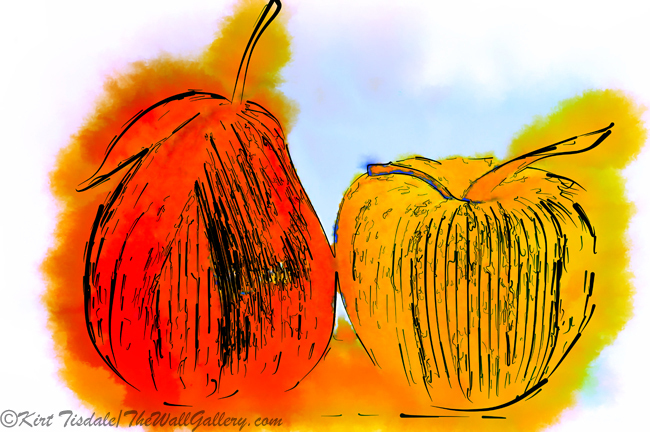 Today’s featured art prints are very simplistic, yet bold. 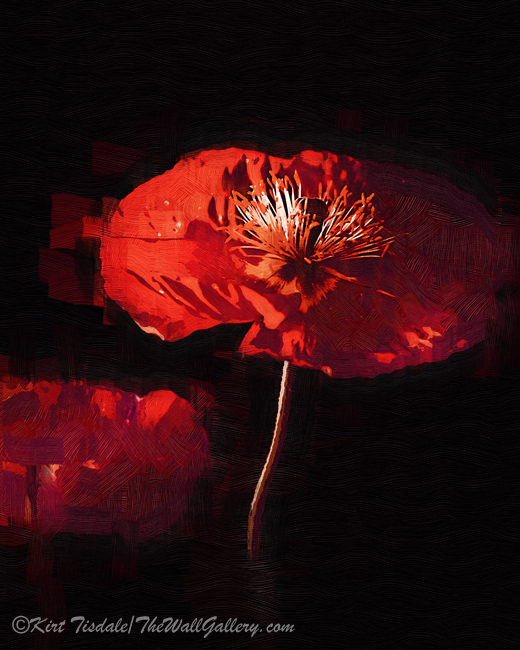 The two prints are titled “Red Poppies” and “Red Poppy” (talk about a stretch for the names). There are three basic elements to these prints, each important for the final look. The first element is texture. I created these two prints using a technique with large, bold brush strokes. The second element is the background. Using a dark background allows the flowers to dominate the print. The third element is the color red. Red is a strong color and creates a bold look. Again, simplistic, yet bold. 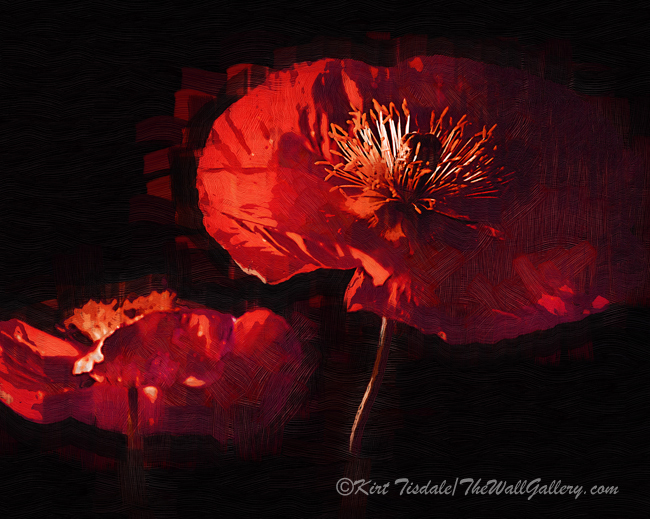 This entry was posted in Art Prints and tagged art galleries, artist kirt tisdale, floral, flowers, interior design, oil painting, online art gallery, poppies, red poppies on September 8, 2015 by Kirt D Tisdale. The wall art prints I wanted to feature this week come from my Abstract Watercolor Gallery. 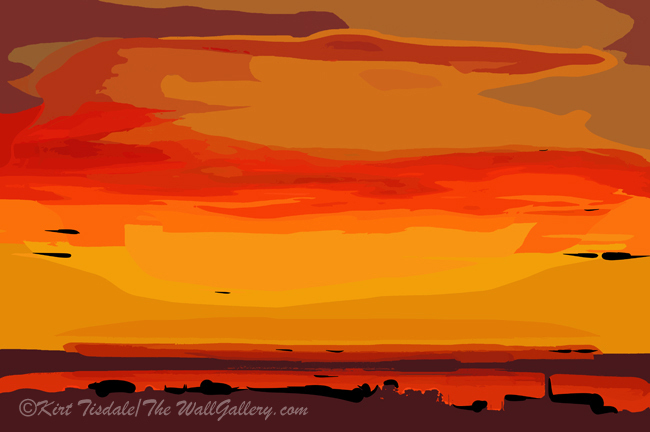 It’s a series of sunset wall art prints that are inspired by the same sunset in the same location. This allows me the ability to showcase a couple of elements as it relates to these prints. The first element is the use of an abstract technique and the second is the color changes that occur within one sunset. So, lets start with the abstract approach in these prints. 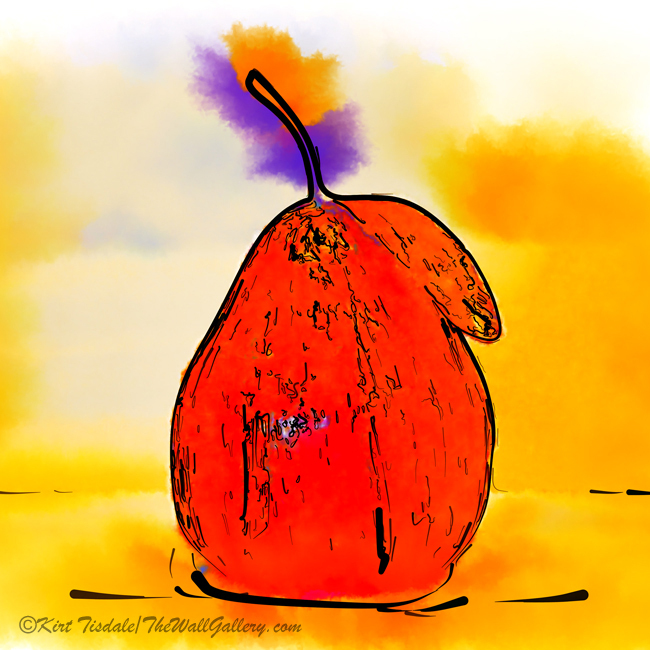 Not everyone is a fan of abstract art and the beauty of art is “that’s ok”. We all react a little differently to various looks, colors and styles. I like abstract art because I appreciate colors and shapes. I don’t need an art print to depict a realistic scene all the time; sometimes I just appreciate the use of colors and shapes. I approached these sunset prints with suggestive shapes and bold colors that were as true to the beauty I witnessed in the sky as I could replicate. That takes me to the second element. 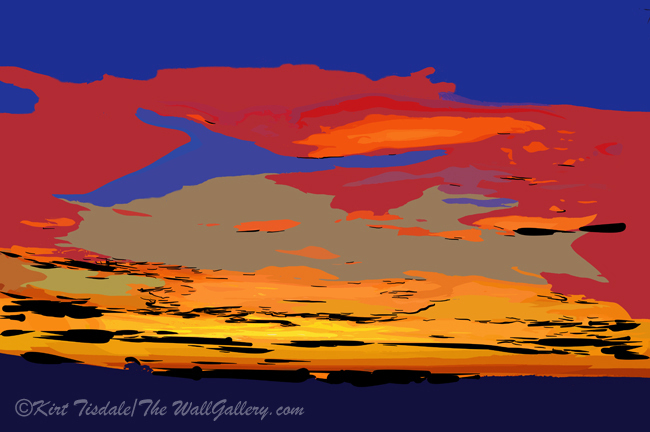 The sunset in these prints was over the coastal area of San Diego County a few years back. The perspective is from a distance looking over the land towards the sea just after the sun has gone down. When you see one of “those” sunsets, you know that the color palette of the sky changes continually as it turns into dusk. This series follows such a sunset. The first one is called Orange Ocean Sunset. The sun has just set and the bright colors dance off of the high clouds over the ocean. The ocean itself turns a bright orange reflecting the sky. 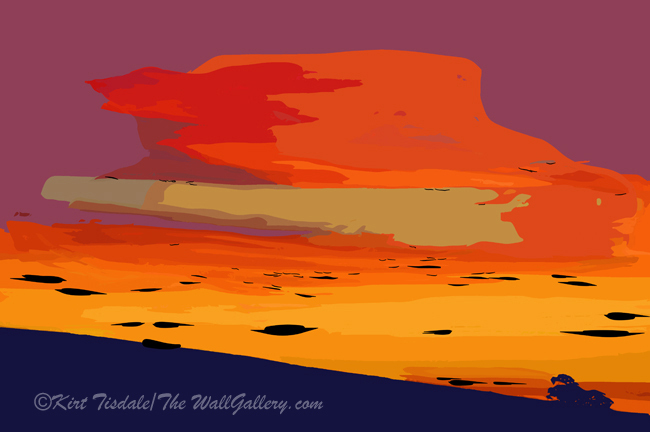 The second one I’ve titled Orange Hillside Sunset. The sun has sunk lower, beyond the horizon, creating deeper colors. The foreground in this print uses a hillside as a balance against the brilliance of the sky. 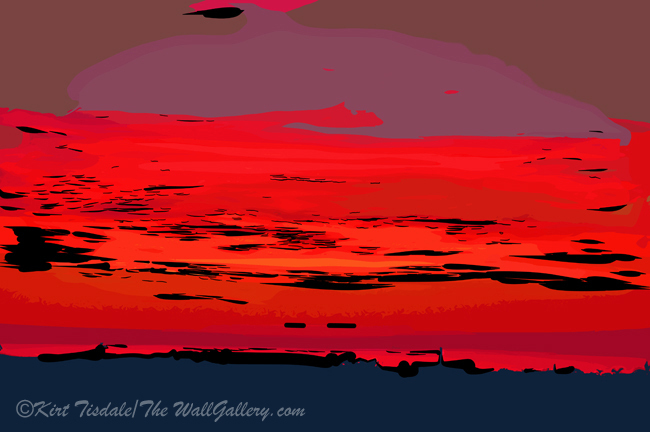 The third print is titled Blue And Red Ocean Sunset. The sun sinks even lower, creating darker hues of the numerous colors and the night sky starts to show as the deep blue towards the top. The fourth print is called Red Ocean Sunset. Dusk has set in and the light fades, but not without a final burst of brilliant red lighting the sky and the ocean. I invite you to visit my Abstract Watercolor Gallery to enjoy these prints and many more. This entry was posted in Abstract Watercolors, Landscapes: Watercolor and tagged art galleries, art gallery, artist kirt tisdale, california, coastal sunsets, interior design, landscapes, online art gallery, pacific ocean, sunsets on July 15, 2015 by Kirt D Tisdale.